Q Can you please give me the sizes in inches of the medium and the large pad? A Thank you for your question! The large Western Cotton Liner pad is 30.75" long and has a 15" drop. The medium is 28" long and has a 12" drop. A Thanks for your question! Our saddle pads and tack are available at tack stores across the country, through many online retailers, and on our website as well. As for Stateline Tack, well, they just haven't picked up our line yet. 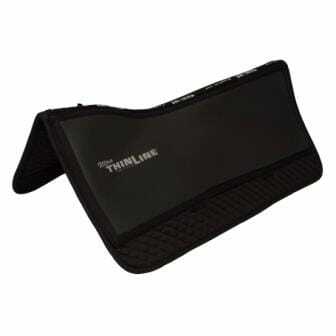 If you prefer to purchase from them, feel free to give them a call and request that they start carrying ThinLine! A Thanks for your question! This pad is durable enough to use on its own and is also thin enough to use as a liner under a show pad. If using on its own, the Ultra ThinLine panels and the high quality, quilted cotton will provide all of the protection your horse needs while still giving you a close feel. Q How thick is this pad without shims? A Thanks for your question! This is a low profile pad that measures about 1/4" thick overall. Ultra ThinLine (3/16") is added to the upper part of the pad where your saddle sits, making that area 7/16".